Universal Studios Singapore is set to bring your scariest nightmares to life once again, with a unique touch of Singaporean flair this year. Taking center stage at Halloween Horror Nights 5 will be a new chapter of True Singapore Ghost Stories inspired by horror stories on the train, an epidemic-stricken HDB block, a hell house featuring paper effigies, as well as the event’s first ever dark house. Starting from 2 October 2015, Halloween Horror Nights 5 will run for 14 nights across five weekends. Tickets are now on sale. Halloween Horror Nights 5 will feature four haunted houses and three scare zones throughout the theme park. Headlining the haunted houses this year is True Singapore Ghost Stories: The MRT, in collaboration with local ghost writer, Russell Lee. This haunted house will feature familiar characters cast in an original storyline created just for Halloween Horror Nights 5 and inspired by tales of paranormal sightings on the train. It will be a ride like no other as Pontianak and Toyol make an appearance. “True Singapore Ghost Stories is quintessentially Singaporean and I am elated that Universal Studios Singapore has developed this exciting new dimension to the book series. The storyline for the haunted house is inspired by reports of paranormal sightings on trains, and fans can expect to see characters from the pages of the True Singapore Ghost Stories transform into reality. The creative team behind Universal Studios Singapore’s Halloween Horror Nights has mounted a spirited effort in this undertaking and I am sure fans are just as excited as I am to hop on board this train ride,” adds Russell Lee. Over at Siloso Gateway Block 50, familiar scenes from the neighbourhood are injected with a sinister twist as a virus outbreak turns residents into flesh-ravaging vultures.The gates of hell will open once again at Hell House as paper effigies rule and guests journey through the Underworld. Tunnel People, the event’s first ever dark house, will have guests feeling their way through the fortress of the Tunnel People in darkness. The immersive scare zones this year include Hungry Ghosts at The Lost World zone – a hidden village with cursed villagers doomed to go through rites and prayers every day; conTERMINATED at Sting Alley – a quarantined sector where forsaken and diseased inhabitants fight for their survival; as well as The Invaders at the New York zone – where a meteor-like alien space probe crashes into Earth and its extra-terrestrial inhabitants take over. “As always, visitors to Halloween Horror Nights 5 can expect a high quality production that has become synonymous with Universal Studios Singapore over the years. It is set to be one of the scariest editions of Halloween Horror Nights yet, and we are looking forward to spread the horror,” added Ms Teo, who is also the Executive Producer of Halloween Horror Nights 5. Ardent fans who want to relive the scares again and again may purchase the Frequent Fear Pass. Now made available for all 14 event nights, the pass allows for unlimited visits to the event. This year, guests may also sign up for the new Behind The Screams tour. Only available on select nights with limited spots, the lights on tour grants an exclusive and inside peek. The tour is only available for guests who have signed up for a daytime VIP tour or RIP tour of Halloween Horror Nights. Beyond the scares, select rides and attractions will also be open throughout the event for even more thrills. These include Battlestar Galactica: HUMAN vs CYLON, Puss In Boots’ Giant Journey, TRANSFORMERS The Ride: The Ultimate 3D Battle and more. There will also be a special screening of the Scared Shrekless feature film at Shrek 4-D Adventure on event nights. Back stories of the haunted houses and scare zones will be unveiled over the next few weeks at www.halloweenhorrornights.com.sg. Fans will also only gain interactive sneak peeks into the haunted houses. Ticketing information can be found in Annex A. 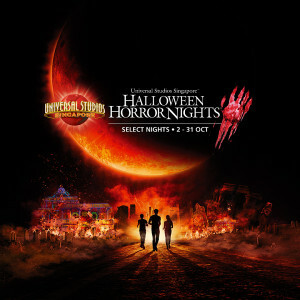 For more information and reservations, guests may visit www.halloweenhorrornights.com.sg, www.rwsentosa.com, call our hotline +65 6577 8899 or contact their local travel agents. This entry was posted in Haunted Attractions, Home Page, Home Page Slider, News and tagged Andrea Teo, conTERMINATED, Halloween Horror Nights, Hell House, Hungry Ghosts, Resorts World Sentosa, Russell Lee, Siloso Gateway Block 50, The Invaders, True Singapore Ghost Stories: The MRT, Tunnel People, Universal Studios Singapore. Bookmark the permalink.